The Commodore 64: A Visual Compendium is a great project. With 200 pages full of huge pixels, maps, cover art and mini-reviews, it's a lovely looking reference book that covers the games of yesteryear all the way up to today's indie hits. To support the production of Sam's 'at proof stage' book, we decided to make a limited number of (PAL only!) Micro Hexagon carts in four colours (grey, red, green and blue) – only 25 of each. The game comes in our Deluxe packaging with a colour-matching inlay, post-mortem/instruction booklet, four round vinyl RGCD stickers, an A3 poster and free worldwide postage, with the higher tier reward including an A2 poster and the inlay being signed by Paul Koller and Mikkel Hastrup. Each copy is numbered, and comes with an RGCD 'certificate of authenticity' label. I've taken some photos of the home-printed prototypes below, and will upload some shots of the final print material when it arrives. It's a pretty awesome package in all, and unless any copies of the game remain unsold, supporting this Kickstarter is the only way you can add an official cartridge of Micro Hexagon to your collection. You can of course download the game for free for use in an emulator or via hardware such as the 1541 Ultimate, but this is a great opportunity to support a great project and get some cool stuff in return. 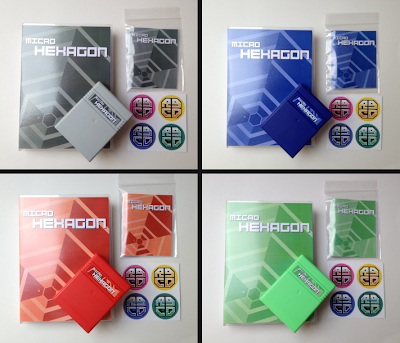 Any copies of Micro Hexagon that are not sold via the Kickstarter reward tiers will be made available via the RGCD online store one month after the Kickstarter ends. Back the Commodore 64: A Visual Compendium Kickstarter here. Download Micro Hexagon for free, here.